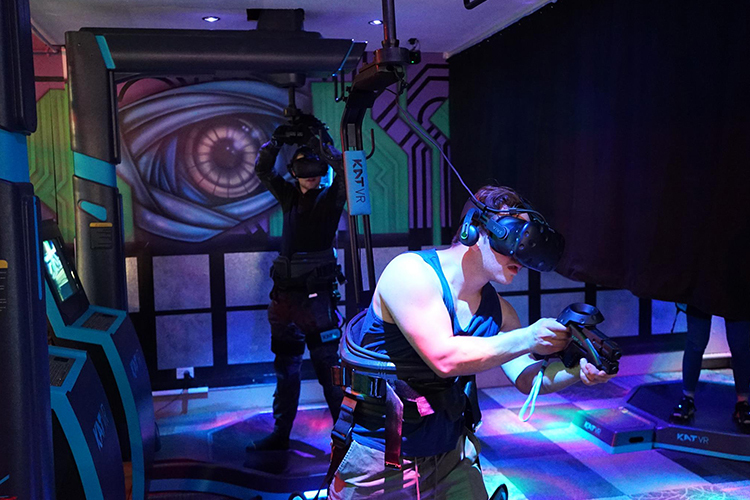 Darkzone introduces Melbourne’s only Kat-Walk Virtual Reality system! 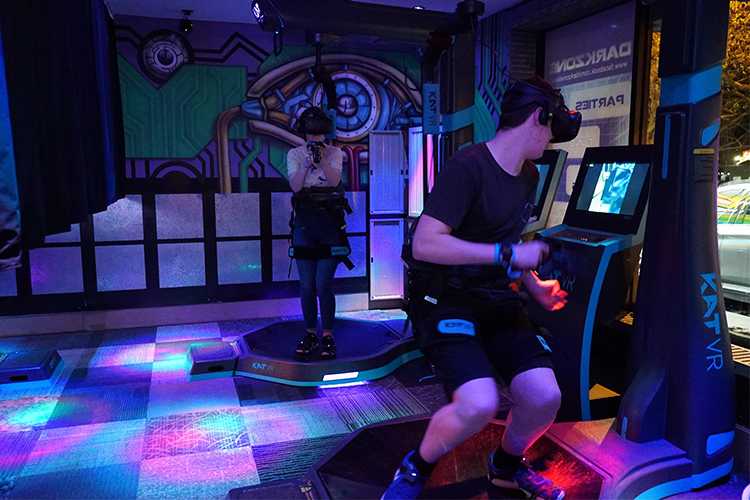 We have four omni-directional walking VR stations breaking the barrier between the real and unreal. Walk into another reality, explore a haunted dungeon, and escape from the zombie apocalypse. Suit up and battle a giant robot, unsheathe your swords and ninja up some fruit! 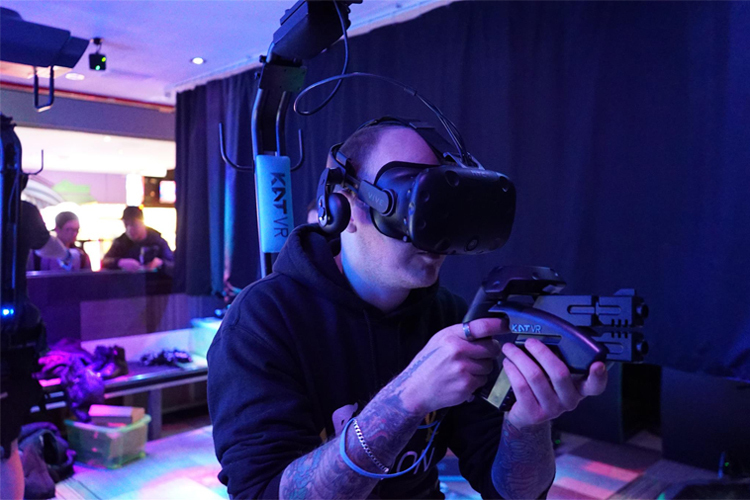 The Kat VR system is awesome fun for ages 12 and up. Book in for an individual session, or bring up to 8 friends for a private booking and battle it out! We have 4 KatVR machines. Which means that up to 4 people can play at once, either individually or in a multiplayer game. Check out our packages here. You’re one of the survivors of a zombie apocalypse that decimated the human race. Now you have to take fate of a local community into your own hands and save your people from an upcoming zombie invasion. 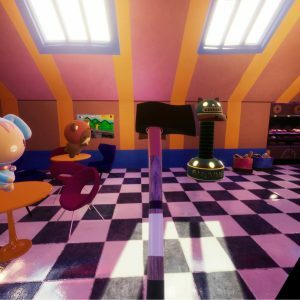 “Lop Nor Zombie” is a first-person VR Shooter filled with puzzles, combat and exploration. Game is very simple to get started but gets progressively more difficult as you go with bigger and more difficult challenges waiting ahead. With your limited ammo, hordes of zombies flanking and attacking you from behind and dark, claustrophobic atmosphere of a post-apocalyptic town, the game is going to be a real challenge for both casual players and for experienced gamers. 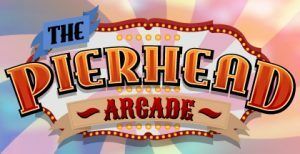 Hammer 2 Reloaded is an action game with a third person perspective. You will incarnate Hammer – a hero of modern times! Take your rifle and kill anyone who gets in your way! In your missions use the terrain and vehicles to your advantage! Fight to get the highest score, complete the mission within the specified time and find the secret package! “Desert Range” is a VR simulator of a military shooting range. Just find your targets, aim and pull the trigger! Take down as many targets as you can in the shortest possible time, set new records and compete with your friends! Become a real adventurer and arrive at a mysterious tomb’s gate. Step inside to explore the depths of ancient temples but don’t forget to bring your guns. The deeper you walk in, the more fearsome monsters you will have to face. Stay vigilant at all time as you never know what’s hiding for you behind the corner. Solve the mystery and experience an adventure, even good old Indiana Jones would be proud of! Built exclusively for VR, A-Tech Cybernetic’s Story Mode will offer hours of explosive fun, while Swarm Mode will test your grit in a sci-fi nightmare scenario. Stop the mutant invasion at a futuristic megacorp, controlling an arsenal of weapons with real life movements! Pick from a variety of weapons and get slicing! Cut your way through hundreds of various donuts, but don’t forget to avoid the bombs. This game is super kid-friendly and easy to pick up, but challenging to master.